Recent Revelations that the Elbphilharmonie in Hamburg may not be the "acoustically perfect" concert hall it was hyped as come as no surprise. 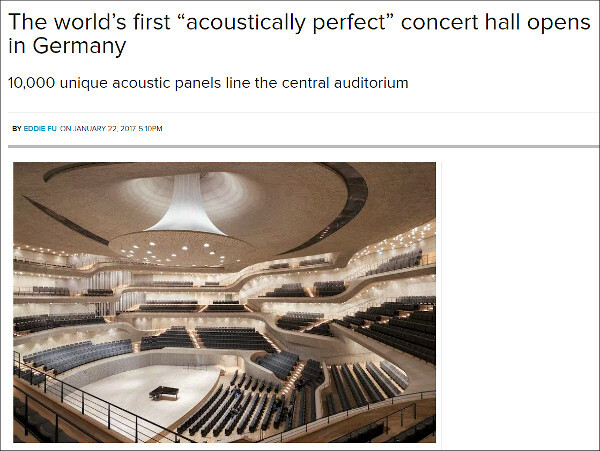 Because there is no such thing as an acoustically perfect concert hall. A perfect hall would allow audience member to hear the sound of the instruments without the complex reflections, reverberation and diffusion that every auditorium adds. The audience would simply hear the sound of the instruments as played in an anechoic chamber. Which is a totally dead sound that would be quite unacceptable in a concert hall. Every concert hall is different. So every hall adds different reflections, reverberation and diffusion to create its own unique sound. These reflections, reverberation and diffusion are designed into the hall by its architects and acousticians to create the best approximation of 'concert hall sound', a convention defined by 19th century halls such as Vienna's Musikverien and Amsterdam's Concertguebouw. 'Concert hall sound' is not a set of scientifically derived parameters, it is an expectation - note that important word - which varies from person to person. Moreover every listener hears sound differently because the size, shape and density of the head, ears, ear canal, nasal and oral cavities - all of which modify sound - of every human are different. Then there is the premise of quantum theory which states that by the very act of watching, the observer affects the observed reality. In other words, the very act of listening affects the sound we hear. 'Perfect concert hall sound' is an illusory expectation which is unique to each listener and varies from person to person. Basing judgement of the Elbphilharmonie - or any hall - on expectations based on media hype is counterproductive. As is often the case, perennial wisdom provides clarity. Buddhism teaches that there is no ultimate reality. Instead there is anatta (not self). This is the realisation that not only is the search for an ultimate reality futile, but also the unachievable expectations we build of that ultimate reality are the cause of our persistent dissatisfaction. Translated into acoustic terms this means that not only is the search for sonic perfection futile, but the unrealizable expectations it builds creates disillusionment when those expectations are not met. This explains why, when expectations are low, satisfaction is often higher. For instance I did not expect much from a Mozart Requiem played by the perfectly respectable but not BPO/LSO standard L'Orchestre Philharmonique du Maroc in a most definitely not Elbphilharmonie standard school gymnasium in Morocco. But that performance counts among my most rewarding musical experiences. Different expectations for different folks: if the Moroccan audience, which lacks the expectations surrounding an 'acoustically perfect' hall, was transported to the much-vilified Barbican Hall in London for a Mozart Requiem, it would doubtless enthuse about the 'perfect' sound. Classical music can learn much from the Buddhist teaching of anatta. Not only is the search for an acoustically perfect concert hall futile and damaging - boosters of London's proposed Simon Rattle Hall please note. But so is the search for 'iconic' musicians that meet expectations of celebrity, a search that relegates other talented musician to the status of also-ran. And also futile and damaging is the search for music masterpieces: because it marginalises much excellent music which fails to meet the arbitrary and meaningless 'masterpiece' expectation. With thanks to music therapist Lyle Sanford whose email about a revelatory Beethoven Seven played by his community orchestra in a vacant hardware store in Orange County sparked this post. My social media accounts are deleted. But new Overgrown Path posts are available via RSS/email by entering your email address in the right-hand sidebar. Any copyrighted material is included for critical analysis, and will be removed at the request of copyright owner(s).